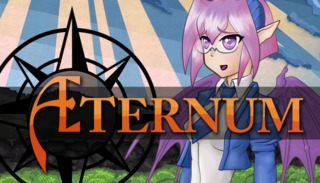 Aeternum is an independently developed shmup and the debut title from Creaky Lantern Games, where players will have to dodge a significant amount of bullets, beams and various projectiles while defeating enemies to unravel the mystery of Aeternum Academy's missing students. The game features corgis in UFOs, cats in teacups and a generally light-hearted aesthetic that belies its brutal old-school difficulty. Aeternum features 3 playable characters, online leaderboards and includes the game's soundtrack as free DLC on the Steam platform. The stages scroll automatically from left to right while players move and shoot anything that is not them while attempting to dodge incoming fire. As the player defeats enemies, they drop tokens that gradually increase their shot power and spread. While the player's character moves fairly quickly on their own, a "Focus" button can be pressed that slows down player movement, narrows their shot spread for more directed power and makes their hitbox visible to allow them to more easily weave through bullets. The player's hitbox is represented as a heart on their character sprite. Any hits to another part of their character sprite are tallied by a "Graze" counter, which acts as a score multiplier and as an added incentive for high-level players to engage is riskier playthroughs. The game does not have a life system. Players are punished for getting hit by losing their power-up tokens. They can avoid this by having a stored "Panic" to use. The Panic system creatures a shield around the player, temporarily turning bullets into power-up tokens and shielding them from harm. This can be triggered voluntarily, or if the player takes a hit before triggering the shield, one Panic is consumed and all fire temporarily vanishes from the screen. If the player has no stored Panics and loses all their Power, the next hit will be a Game Over.